The last time Israel made it into a top-level soccer competition was 1970, when it went to the World Cup in Mexico. Now, with an excellent start to the 2016 UEFA European Championship qualification tournament, the expectations are once again high. One reason for this is that the tournament has now expanded from 16 to 24 countries, allowing some of the smaller nations a chance at Europe’s top competition. The country will stand still when the National Team marches onto the field on Saturday night, March 28 after Shabbat in Haifa for the Wales game, and on Tuesday, March 31 in Jerusalem against Belgium. Guy Haimov, one of the three Israel National Team goalkeepers looking to claim the starting position for Israel’s crucial Euro 2016 qualifiers. As I was walking up to the Kiryat Shemona Municipal Stadium, I saw the beautiful snowcapped Hermon Mountain in the background of this picturesque facility planted right in the middle of a suburban neighborhood, far away from the hustle and bustle of Tel Aviv. This is where the 2014 Israel State Cup champions play and train for their matches against the other sides in Israel’s soccer league, Ligat Ha’Al. I was waiting for Guy Haimov, one of the three Israel National Team goalkeepers looking to claim the starting position for Israel’s crucial Euro 2016 qualifiers. Suddenly, I saw the figure of a man on a bicycle pulling up into the front area of the stadium. You guessed it: Haimov rides his bike to work each day. “I live close by and it’s good exercise” the 6-ft. goalkeeper said as we met at the main gate. Israel started their European qualifying campaign by winning all three of its games and sits on top of their group with nine out of nine points. The upcoming match against Wales will feature one of the world’s best and most popular players in Real Madrid’s star Gareth Bale. Belgium is ranked fourth in the FIFA World Rankings and has a collection of greats including Chelsea’s Eden Hazard and Manchester City’s Vincent Kompany. Guy Haimov preparing for practice. Sitting on the plastic molded seats we began discussing where we both came from. “Isn’t it dangerous in Jerusalem?” he asked me as I told him that I had traveled more than three hours to watch the previous night’s Israel State Cup match with Maccabi Tel Aviv that ended in a 1-1 tie. I countered, “Isn’t it dangerous here in Kiryat Shemona with what went on recently with Hezbollah by the border?” We both said no, we don’t feel threatened at all, soccer is our escape and savior from the harsh realities that surround Israel and the Middle East. “I grew up in Holon and both my parents were born in Israel,” Haimov said. Maccabi Tel Aviv was always my club, beginning when I joined the youth system at five and a half years old. In school I played soccer and I had no idea I would end up being a professional. We just played for fun and to be together with friends; that was the most important thing when I was a youngster. It was much later when I saw that I was good enough to play on the youth Israel National Teams at ages 14-17 when I started seeing myself potentially making it as a soccer player and as a professional. At 7 years old I realized that I just couldn’t keep up with the other kids. If I wanted to be like my idols Alexander Uvarov, the great Macacbi Tel Aviv shot stopper, Gianluigi Buffon of Juventus, or Iker Casillas at Real Madrid, I would need to change positions. I was lucky my parents didn’t think too much about it perhaps being a dangerous position to play and didn’t have a problem with me being a goalkeeper so off I went. Growing up in the Maccabi youth system offered me the chance to receive the best soccer education both from the top coaches and some of the best players. All of the best kids wanted to go to Maccabi Tel Aviv because they were the biggest club in Israel and they had terrific management. As Haimov continued to ply his trade under the watchful eye of Maccabi, he finally broke through to the club’s first team and started his first Israel Premier League match against Hapoel Petach Tikva on March 11, 2006 under interim coach, Dutchman Ton Caanen. He would have one more start that season but would end up tearing a ligament in his shoulder which would put him on the shelf for 8 months. However, when he finally came back from injury he was loaned out to Kfar Saba of the second division for a number of years. Haimov thought that after his spell with Kfar Saba he would be back with the yellow-and-blue as the second choice keeper under former youth coach Ran Ben Shimon, but fate again would place him back into the second league for the 2009-10 season, this time with Hakoach Ramat Gan, under the watchful eye of former Israeli legend Vicky Peretz. After a good season, he finally had his chance to play significant games in the Premier League as up-and-coming club Kiryat Shemona, who now had Ran Ben Shimon as their manager would snag him own loan in 2010-11. Kiryat Shemona is certainly a long way from the friendly confines of the Tel Aviv area and for someone who grew up in the center of the country, to move up north was something quite unique and definitely different. But soccer is soccer and Haimov had finally earned his chance to spend some serious minutes in goal playing against the best talent Israel offered. It was also an opportunity to wipe away some grudges as Haimov’s side defeated Maccabi Tel Aviv 4-0 and earned a shutout against his former club. “After that match, Maccabi, which now had manager Motti Ivanir in place of recently fired Avi Nimni, wanted me back and I signed a 3-year contract,” he said. One of the biggest thrills in my career was to beat Greek powerhouse Panathinaikos in the UEFA Europa League at home in Bloomfield Stadium 3-0. As well, I scored a clean sheet against Tel Aviv rivals Hapoel winning 1-0 which was an incredible feeling, especially when I had to be interviewed by Avi Nimni, Maccabi’s former manager who didn’t want me. That gave me incredible satisfaction knowing I was able to show those who doubted me that I could reach the top. I understood that it was nothing personal and in order for me to continue to progress I needed playing time. That’s where Ran Ben Shimon came back into the picture again and I joined him in Cyprus on loan once again. Going to Cyprus was the best decision that I made and I had no time to think about it as everything happened so fast. There were about 10 other Israeli soccer players in Cyprus at the time and the Rabbi at the local Chabad house made us feel so welcome. The supporters were also extremely kind after they found out what I could do for their club and I didn’t feel one negative sentiment the whole time I was there. I came back to Maccabi Tel Aviv for the 2013-14 season training camp under new coach Paulo Sousa but I knew I would not begin the year with the club. My agent Gilad Katsav was able to secure a transfer back to Kiryat Shemona as owner Izzy Sheratzky bought my contract and I became the undisputed #1 starter for the team. Sheratzky is ironically a savvy Tel Aviv businessman who decided to take a small time club in a quiet town and build it into a contender that is able to threaten teams with much larger budgets than theirs. In his first year back up north, Haimov played in every Israel league match last season where he had a staggering 14 shutouts leading Kiryat Shemona to a third place finish. The team also won the Israel State Cup for the first time in the franchise’s history and had the chance to hoist the trophy after being presented by the outgoing president, Shimon Peres. This year the team is fighting for the legue title, only a few points out of first place, behind Maccabi Tel Aviv. “I am always active and never rest as I’m always prepared to play in every game. If you relax and take games off you become vulnerable,” the keeper professed. It’s thanks to Hezy Nachshon & Koby Bitran who coached me when I was young at Maccabi, Ami Genish my goaltending coach at Ramat Gan and now Pini Avraham the Kiryat Shemona keeper coach that have made me the athlete I am today, and gave me the opportunity to play the way I am capable of. Of course Barak Bachar, my coach and former teammate at Kiryat Shemona, has tremendous confidence in me. When we both played together back a few years ago we used to play Playstation and we ate together on Friday nights. Now that he is coach we have been able to adapt the relationship to be that of player and coach. I know Guy since he was 13, and after a few practices with the Maccabi Tel Aviv youth program, I saw that he was ahead of the other children playing keeper. I took him on as a personal project where I would work with him prior to the regular practice. Dudu Aoute had been the starter for so many years and now that he is retired the opportunity is open. I would love to be able to get a chance to play again for Israel as the only game I did play was a huge disappointment. I had come in for an injured Aoute in the second half of a match in Croatia, but we got a red card early on and I ended giving up three goals as we lost 3-1. It’s my dream to be able to lead Israel out onto the pitch against Wales and Belgium knowing it’s a responsibility to represent Israel and the Jewish people around the world. I want that second chance. The competition is stiff with Ofir Marchiano of Ashdod and Ariel Harush of Netanya looking to claim the coveted spot, however both Nachshon and Ami Genish weighed in saying that Haimov without a doubt should be the starting keeper for the National Team. Perhaps the fact that he wears the number 55 for his club team representing double hamsa, will help as well and he will be between the pipes at the end of March. Very often, the cream of the crop of Israeli players head over to the stronger leagues in Europe to see how they can match up against the best of the best, but for now Kiryat Shemona is Haimov’s home as the 29-year-old has no designs to play outside of Israel again, but as he says you never know. He also understands that the lifespan of a goalkeeper is much longer than that of a regular player and has many years left to give on the field of play so he has not thought much about what will be after his career is over. “I can play until 40 and after that I would like to get my coaching certificate and be a goalkeeper coach or even a head coach,” he said. 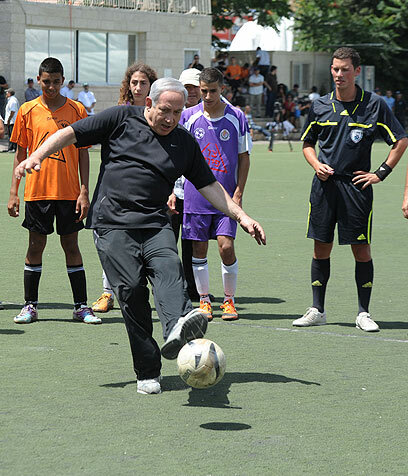 If I was the head of the Israel Football Association I would invest in the youth. From facilities, to the culture and seriousness that we see around the world, this is something that is a must in Israel. You can see the difference in other countries, Israel must put its energies into the youth program and help the many talented players that our country has. This is where we need to build and put our best efforts into. We should be proud to be Jewish, we should never be afraid to do anything, we should reach for our dreams because G-d is with us and we can rely on G-d for guidance. Come and visit Israel to see the wonderful cities, encounter the people, but most importantly come to the Holy Land and support us. Who could refuse such an invitation, as the Israel National Team is about to embark on two of their most important matches in the last 45 years? Due to its similarity to soccer and the smaller field and number of players, futsal is an extremely popular hobby around the world. “Futsal in Brazil is like basketball or baseball here in the U.S. In fact, at younger ages they play it instead of soccer,” explained Michael Monheit, chair and head coach of the U.S. futsal team for the upcoming Maccabiah Games. Two years ago, Monheit established the American Futsal Academy in King of Prussia. “Before that, clubs in the area used futsal for practice, but there were no actual futsal clubs here,” he said. We established a new club in order to bring together the best futsal players in Greater Philadelphia, and we won the northeast championship in three age categories in our debut season, and in two age categories last year. While the popularity of the Major League Soccer has increased since the arrival of European stars in their early 30s such as David Beckham and Thierry Henry, futsal is a bit different game: Each team has five players on a field about the size of a basketball court. “Due to the smaller number of players, the players need to be more versatile,” said Monheit. The four field players switch positions all the time, and even the goalkeeper has an important role in starting counter-attacks after he makes a save. Because of the size of the field, the transition from defense to attack is a lot quicker. For soccer teams, futsal is an important practice way for those aspects. “Most of our players played soccer for most of their lives and only recently started playing futsal regularly,” continued the coach. Futsal is growing around the world and about 20 teams will participate in the coming tournament. Despite that, I believe that we have a real chance to win a medal. We practice a lot and participated as a team in northeast tournaments. If you defend well, you can keep the score low and have a chance to beat a technically better team. One of the players in the team is Monheit’s son, Matthew. The 21-year-old played soccer since the age of 4 and until last year, including the famous Coppa team in high school and the varsity team of MIT, where he studies environmental engineering. He has also participated in the previous Maccabiah Games with the Under-19 soccer team. While being able to play in all four field positions, he prefers to play as the pivot — standing close to the opposition goal and taking advantage of the defense’s marking of him to create scoring opportunities for the two wingers playing on his sides. Unlike other players, which are often coached by their fathers in early ages, it’s the first time that my father coaches me. I really enjoy it. It helps me understand the game on the team level, and I also help him in the organization of the team, like an assistant coach. On the other side of the field you can find Mike Markovitz, who plays as a “defender.” In addition to being the last line of defense, he coordinates the attacking play. In ninth grade, after 10 years of playing soccer for local teams, he joined the Lower Merion Velez, where under an Argentina-born coach which was specialized in futsal he participated in a few tournaments every year. At 20 years old, he captains the University of Pennsylvania club team, as he chose to focus on his bio-medical engineering studies and not to join the varsity team, which practices more often. In the summers, he plays for Philly United in the national Under-23 soccer league. After representing the U.S. in smaller Maccabi tournaments in Argentina, Italy and Australia, he was hoping to qualify to the soccer team for the coming Maccabiah, but was eliminated in the trials as he was injured at the time and could not play to his full ability. To his fortune, Monheit was present in the trials and advised him to join his team. “After watching some of our rivals in video, I think we have a good chance for a medal,” Markovitz said. I really like the squad that we have. Since most of our players are young, if we keep holding practices after the tournament we will return much better for the 2017 games. I am very excited to play for this team and to fly to Israel for the first time. Samuel Stone from Maplewood, NJ – Bryant College.